Yellow stains are the biggest humiliation sweating brings with it. Everyone who sweats heavily has been there. You just cannot wear a shirt with yellow sweat marks on it. There goes all your money in waste. But this is not the end of it. You waste even more money on buying new sets of clothing to avoid these stains. There seems no remedy to it. Until you land at this blog and read ahead. Yellow stains often seem permanent and unavoidable. But there are tested ways to keep your clothes from yellowing. Follow any of these tips discussed below and see the yellow marks go away. It is not just the sweat that causes yellow stains. When sweat mixes with the antiperspirants, there emerges the yellow colouring. It is primarily the antiperspirant that causes the yellow marks on your clothes. Hence, it is better to stay away it for the good. Instead of antiperspirants, you can use a natural deodorant to keep the odour away. Only that deodorants do not work for heavy perspiration. 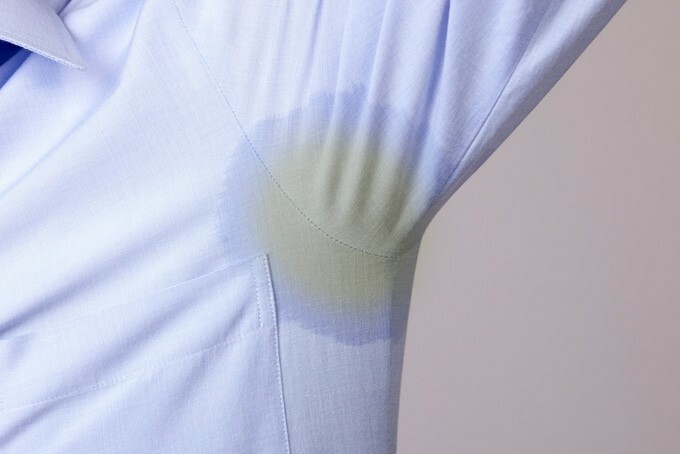 If you have an excessive sweating problem, you may want to use the antiperspirant at a limited level. It will help in keep the staining to the lowest possible quantity. There are various ways with which you can save your clothes from staining. The first means is to submerge your clothes in vinegar and hydrogen peroxide. This mixture will keep the stains away. Another means is to soak the clothes in OxyClean 20 minutes before washing. It will easily clean the yellow stains. You can also apply any stain remover to the sweat marks to get rid of them. Removing stains from white clothes is the most difficult. Try using a cloth whitener to do the job for you. It is sure to steer clear of the stains and give your clothes a fresh as new look. People usually use bleach as a stain remover. But this really isn’t true. Very strong yellow stains are hard to remove even with bleach. On the contrary, bleach can worsen the staining. It is important that you do not use bleach at all for sweat marks on your clothes. Since it increases the yellowing, it is better to keep your clothes away from it. It is obvious that a long day robs you off your energy. You want to undress and roll up your clothes in a bundle. But this is a major cause of yellow stains. When sweaty clothes are left untreated, the sweat and antiperspirant will mix to form the reaction. The yellowing is a direct consequence. Therefore, it is important that you pre-treat your clothes right away removing them. 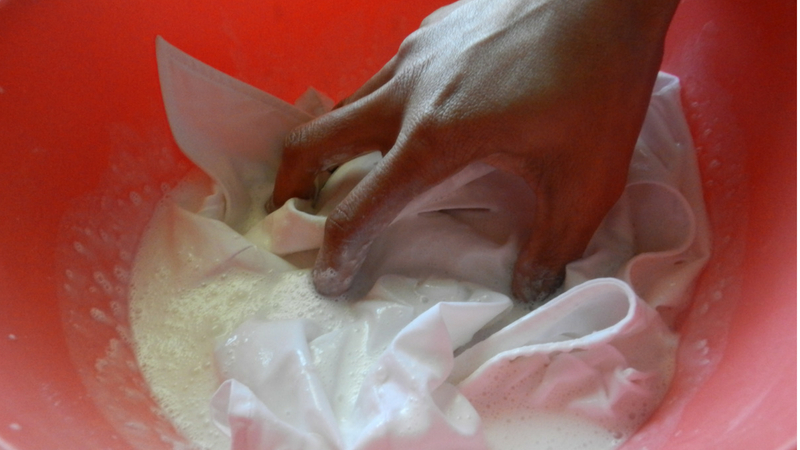 Soak the clothes in a bucket of water with OxyClean or a mixture of vinegar and hydrogen peroxide or a whitener. 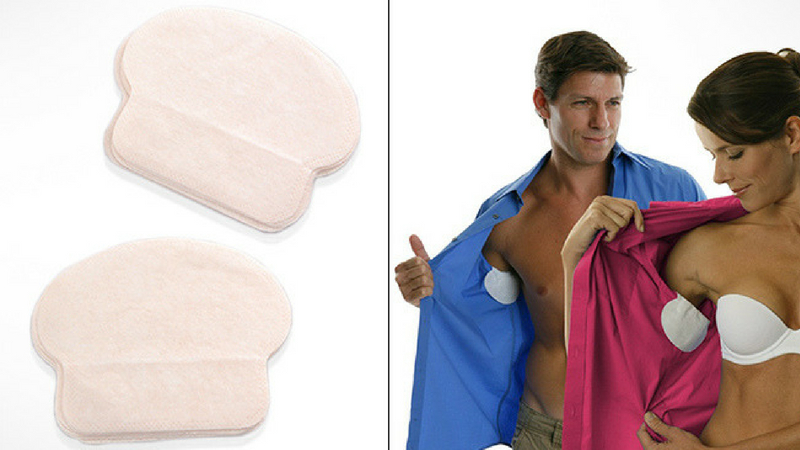 A good way to keep the stains away is sweat pads. A sweat pad blocks contact between the sweat and the antiperspirant. Therefore, there is no yellowing. They will also absorb sweat and keep your armpits dry for a considerable amount of the day. This is a good solution for those who do not experience heavy sweating. Sweat pads are not so reliable for patients of excessive sweating. They cannot go on throughout the day and require regular maintenance. A protective undershirt is your best way out for yellow stains. Once you don an undershirt, you eliminate the possibility of staining. India’s first ever anti-sweat undershirt from NGwear will do the job for you. This is a 100% cotton undershirt with great sweat-absorbing capacity. You can wear this sweat-resistant shirt throughout the day and feel no wetness. This undershirt is your best option to keep the stains away. It will efficiently absorb the sweat before it comes in contact with the antiperspirant. First, there is no yellowing. Additionally, the shirt prevents any sweat from reaching your clothes. Therefore, even if there is any yellowing, it does not touch your clothing. Yellow stains are a real headache. For those who sweat heavily or suffer from auxiliary hyperhidrosis, it is really hard to keep the stains away. But, not anymore. These are some lesser known means of preventing or removing the sweat marks. You can employ any or all of these means to protect your clothes and stop further wastage of money. Read here to know the best deodorants to get rid of sweat stains.